On power up the LED will show “Red” to indicate the pedal is working. After finding a micro SD card with valid MP3 files it will then go from “Red” to “Orange” for ready. Use the “Track” switch in combination with the “Mode” switch to pick the MP3 track to play (up to 48 tracks). 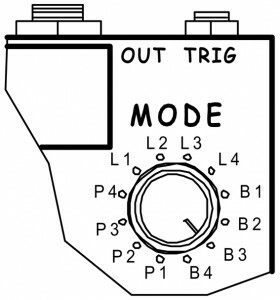 The switch is marked 1 to 12 and for the mode switch set to “P1”, Track Switch position “1” will select the track numbered 00001 on the memory card and position “2” will select track 00002 and so on up to track “12” (00012). See the “BakTrak – File & Song Name Chart” for more info. Play – (P1, P2, P3, P4) Hit the Play/Stop footswitch to start the track. The LED will go from “Orange” to “Green” while the track is playing. Hit the footswitch while the track is playing and it will “Pause” with the LED “Flashing Orange” hit it again and it will start from where it was paused. Hold the footswitch down for 3 seconds to stop the track. Loop – (L1, L2, L3, L4) Hit the Play/Stop footswitch to start the track. The LED will go from “Orange” to “Flashing Green” while the track is playing. Hit the footswitch while the track is playing and it will “Pause” with the LED “Flashing Orange”, hit it again and it will start from where it was paused. 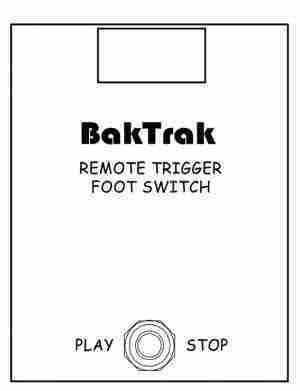 Hold the footswitch down for 3 seconds to stop the track. 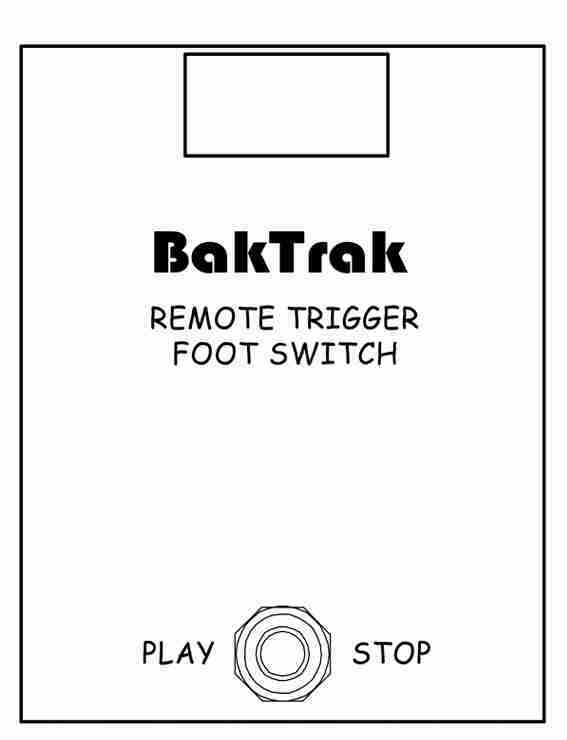 BakTrak – (B1, B2, B3, B4) Hit the Play/Stop footswitch to start the track. The LED will go from “Orange” to “Flashing Red” while the track is playing. 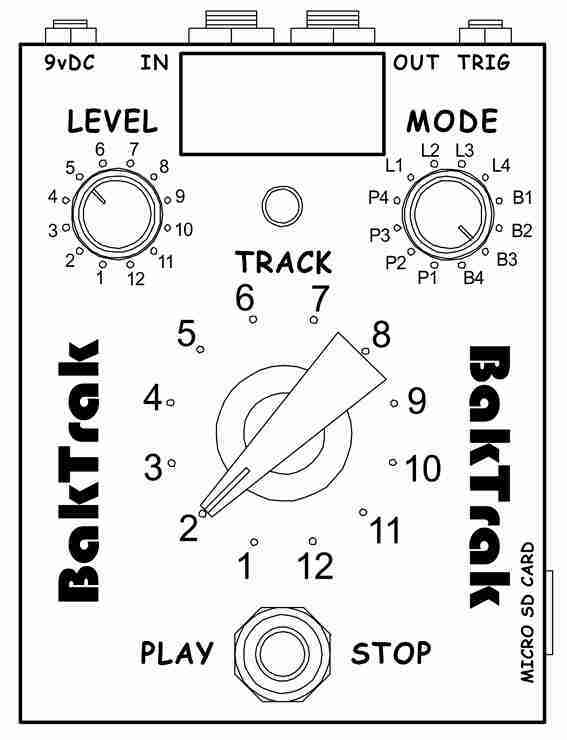 Hit the footswitch while a track is playing, and the track will jump back 10 seconds, hit it again and it will jump back another 10 seconds, hit it again and go back a further 10 seconds (30 seconds maximum) or the start of the track, whichever is the shorter time and play from there. Hold the footswitch down for 3 seconds to stop the track. 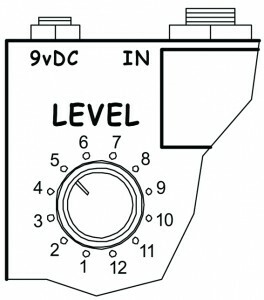 The power supply is a 230vAC to 9vDC plug in unit and connects to the pedal via a low voltage plug. to a FAT32 file system. 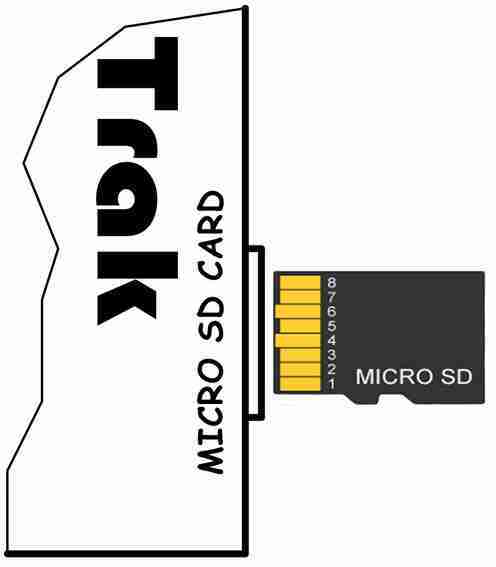 Cards from 4GB upwards are normally formatted for a FAT32 file system but not all guarantee SPI mode compliance, so its best to check. The MP3 files that you want to select with BakTrak must be located in the ROOT directory (not in folders). 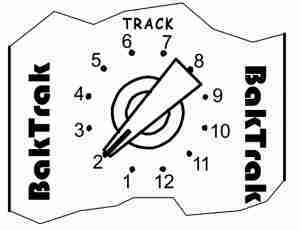 BakTrak can read any MP3 file, but you must name it using the correct 5 digit number for the first five characters in the filename, then ending with the normal “.mp3” file extension. See the “BakTrak MP3 File & Song Name Chart”. You can also add in the song names to make it easier to sort out your music (ie) nnnnn x…x .mp3 (Where “nnnnn” is the track number from 00001 to 00048 and “x…x” is the song name, limit for the file name length is 65 characters, including the file number and the .mp3 file extension). 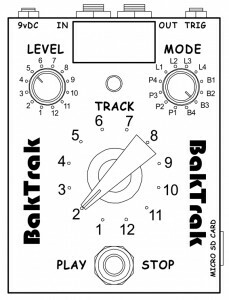 The “Mode & Track” switches allow for 4 different groups of 12 tracks, that means you can select up to 48 MP3 tracks and play them in any one of the three modes “Play”, “Loop” or “BakTrak”.